In this study, the researcher shall discuss the impact of capital structure on the earning capacity of the companies, listed in Muscat Securities Market. The aim of the study is to identify the effects of the capital structure on the operating profit and the earnings per share (EPS) or the banks, manufacturing companies and the service providing companies in Oman. On the other hand, the researcher is to discuss the trade-off theory in the lights of the capital structure decision making of the Omani companies. Detail discussion of the factors that affect the capital structure decision making is also to be made in order to analyze the profitability of the companies of the study. In this study, the researcher would be able to identify the capital structure of the Omani companies. The researcher is to make discussion on the debt and the equity capital of the companies in the Muscat Securities Market to analyze the profitability of the companies (Hussain et al. 2015). Moreover, the study would facilitate the researcher to identify the application of Trade-off the theory of capital among the Omani companies in the Muscat Securities Market. From the above table, the researcher is to mention that the debt of Bank Dhofar was RO 3116532000 in 2015. The same was RO 2868809000 in 2014. On the other hand, the equity of the company was at RO 361029000 in 2015, which was RO 325318000 in 2014. In this context, the researcher is to mention that the debt-equity ratio of the company is 8.6: 1 in 2015 and 8.8: 1 in 2015. Moreover, the trend of the debt proportion in the capital structure is seen as negative and therefore, the researcher could mention that the management of the company declines the debt to enhance the profit to the shareholders. In case of National Bank of Oman, the researcher has seen that the debt proportion of the company has decreased significantly in 2015. The debt of the company was more than 3 times of the equity capital in 2011 to 2014. This proportion has decreased to 1.33:1 in 2015; hence, the debt proportion has decreased in 2015. Al Anwar Holdings has a low debt proportion in the capital structure as the debt-equity ratio of the company was below one for the last five years. In this context, the researcher is to mention that the debt of the company was around 8% of the equity capital. On the other hand, the researcher is to mention that the quantity of debt has increased to RO 3022000 in 2015 along with the enhancement of the equity capital. Therefore, the proportion of debt has increased to 0.09:1 from 0.03:1. The debt of Al Hasan Engineering Co. was more than the equity capital of the company in 2015. In this context, the researcher is to mention that the company had a lesser debt proportion in 2011 to 2013 as the debt-equity ratio of the company for the above-said period were below 40% of the equity capital. In 2014, the debt proportion has increased to 0.6:1 and the same has become 1.7:1 in 2015. The researcher has seen that the debt of Phoenix Power Co has decreased over the last five years. In this context, the researcher is to mention that the company has raised funds by issuing equity capital and therefore, the equity capital of the company has increased from RO 118125000 to RO 137203000 in 20105. If the discussion is to be made on the trend of debt in the capital structure, the researcher is to mention that the debt capital of the company has decreased from RO 478087000 to RO 432839000 in 2015. Dhofar Insurance Co had a low proportion of debt in the capital structure from the research period of 2011 to 2015. In this context, the researcher is to mention that the company has increased the quantity of debt over last five years. Moreover, the equity capital of the company has also decreased from RO 43613048 to RO 41392272 in 2012. This amount has decreased to RO 34729944 in 2015. Therefore, the debt-equity ratio of the company has increased to 0.06:1 in 2015 from 0.03:1 in 2011 (Gulfbase.com. 2017). From the above table, the researcher could found that the EPS of the company increases with the decrease in the debt proportion in the capital structure. With the EPS, the operating profit of the company has also increased to RO 115226000 in 2015 from RO 98851000. The return on investment is also at the highest point when the debt-equity ratio is the lowest. The net profit after tax of the company has also increased in the last five years. In this context, Hussain et al. (2015) stated that the trend of the net profit reflects the trend of operating profit. Therefore, it is to mention that the net profit of the company has improved due to the enhancement of the operating profit of the company. National Bank of Oman has also improved its operating performance through the last five accounting year. The debt-equity ratio of the company was the lowest in 2015 at 1.33:1, whereas the company has earned the highest rate of return in this period. Therefore, the researcher is to mention that the EPS has also decreased from 2011 to 2014. On the other hand, the researcher is to mention that the net profit and the EPS have decreased from 2011 to 2015. Al Anwar Holding Co has also reported an increment in EPS, EBIT, ROI and Net profit after tax. In this context, the researcher is to mention that the company had redeemed the debt instruments and issued equity capital and therefore, the debt-equity ratio of the company has decreased significantly in 2015. The effect of the decrease in debt proportion in the capital structure could be seen in the profitability of the company as the EPS of the company has gone up to RO 0.043 in 2015from RO 0.037 in 2014. Moreover, the researcher is to state that the ROI of the company has increased almost by one percent. In this context, Al-Musalli et al. (2013) stated that the increase in operating profit results in an increment in EPS of the company as operating profits results in an enhancement in the profit available for equity shareholders. In this context, it is also to mention that the net profit of the company has also increased from RO 342,00,000 in 2011 to RO 60100000 in 2015. This could result in an increase in EPS of the company. In case of Al Hasan Engineering Co., the researcher is to mention that debt proportion of the company has increased from 0.29:1 in 2011to 1.69:1 in 2015. According to Hussain et al. 2015,), increase in debt capital in the capital structure of a company results in decrease net profit as net profit is computed after deducting the interest expenses. On the other hand, the decrease in net profit could result in a decrease in the earnings per share as the profit attributable to equity shareholders are computed from the net earnings. The return on investment of the company was 25% in 2011, which has become -0.011% in 2015. As debt capital of the company has increased, the interest burden of the company has also increased and due to which, the degree of financial leverage could have also increased (Hussain et al. 2015). Therefore, the researcher could mention that the NPAT and ROI have decreased for the excessive debt pressure in the capital structure. Phoenix Power has made the highest operating profit in 2015 at RO 36772000. In this context, it is also to mention that the debt to equity proportion has also decreased significantly at 1.33:1 from 3.89:1 in 2014. The operating profit or EBIT of the company was RO 2000 in 2014, and the company has made EPS of RO 0.05. On the other hand, the net profit after tax was RO 28772000 in 2015 whereas the NPAT were negative for consecutive three years since 2011. For this reason, the company was unable to make positive ROI in 2011 to 2013. The EPS were also negative for these periods for negative operating profits. In case of Dhofar Insurance, the debt-equity trend was positive and therefore the EBIT of the company has fallen. Due to the decrease in the operating profit, the NPAT has also decreased to RO 35770 in 2015. In 2015, the company was unable to make any EPS due to a significant decline in the operating profit as the interest burden of the company has increased (Gulfbase.com. 2017). The trade off capital structure theory helps the financial managers to make a tradeoff between the debt capital and the equity capital (Hussain et al. 2015). In the above analysis, the researcher has seen that the companies with high debt capital have low profitability. In case of Al Hasan Engineering Co, the researcher has seen that the earnings of the company were negative when the company had the highest debt capital. As stated by Al-Musalli et al. (2012), the trade-off the theory of capital structure considers interest as the primary reason for decline in the net profits. In case of the above-mentioned company, the net profit, therefore, has declined due to the enhancement of the debt capital. Trade-off the theory of capital structure also considers that the interest payment helps the company to pay minimum tax and therefore, the researcher has seen that National Bank of Oman had a debt of 3.89 times of its equity and therefore the net profit of the company was comparatively lower at RO 50300000 in 2014. The same result has been reflected in the report of Bank Dhofar. In this case, the interest burden has decreased the net profit of the company. 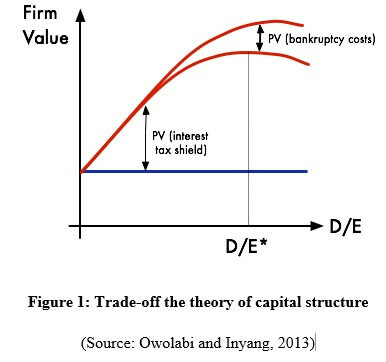 In this context, Morekw and Temesgen (2013), observed that the debt-equity structure of the company affects the income of a company as the capital structure determines the income of the company. Therefore, it can be said that the companies with high debt in the capital structure, would have lower firm value than the firms with lower debt capital. The manufacturing firms in the Muscat Securities Market have higher debt proportions and therefore these firms have lower profitability as measured by EPS, EBIT and NPAT. Capital structure decision making depends on internal and external factors such as interest rate, m, internal rate of return, market size, industry type and competition level of the company products (Al Amri and Al Ani, 2015). The detailed discussions on these factors are made below. Companies with large market size require a high quantity of capital and therefore these companies could not make financing by considering the equity capital only. Therefore, the researcher is to mention that the finance managers are to consider the size of the market to determine the capital structure. The power-manufacturing units and the manufacturing companies require a high quantity of the debt capital at the fixed interest rate. In this context, the researcher is to mention that the growth rate of the manufacturing concerns is less, therefore, finance managers of these companies take loans from government and public (Hussainey and Aljifri, 2012). Therefore, manufacturing firms in Oman have higher debt proportion as compared to the banking companies and therefore, the researcher is to mention that the industry type is required to be considered for selecting the optimum capital structure of a company. According to Al Amri and Al Ani, (2015), firms, in the competitive industry could not take many loans as debt capital results in a decrease in profit. In this context, the researcher is to mention that the decrease in profit could result in lack in competitive advantage and therefore, the management of a company is to consider the competition in the market in order to take capital structure decision. In the initial portion of the study, the researcher has found that the debt capital affects the profitability of a company. In the next part, the researcher has observed that the banking companies require a low amount of debt as the growth rate of this industry is higher than the manufacturing companies. On the other hand, the researcher has seen that the service providing companies earns higher EPS as compared to the manufacturing companies and banking companies listed in Muscat Securities Market. Al Amri, M. and Al Ani, M., (2015). The determinants of capital structure: an empirical study of Omani listed industrial companies. Verslas: teorija ir praktika, (2), pp.159-167. Al-Musalli, M.A.K. and Ismail, K.N.I.K., (2012). Corporate governance, bank-specific characteristics, banking industry characteristics, and intellectual capital (IC) performance of banks in Arab Gulf Cooperation Council (GCC) countries. Asian Academy of Management Journal of Accounting and Finance,8(1), pp.115-135. Gulfbase.com. (2017). Muscat Securities Market | Companies List. [online] Available at: http://www.gulfbase.com/company-list-muscat-securities-market-6 [Accessed 29 Mar. 2017]. Hussain, S., Hussain, M. and Awais, A., (2015). CG and Its Impact on Firm Performance: Comparison of UK and Oman. Academic Research International, 1(6), pp.124-135. Hussainey, K. and Aljifri, K., (2012). Corporate governance mechanisms and capital structure in UAE. Journal of Applied Accounting Research, 13(2), pp.145-160. Morekwa Nyamongo, E. and Temesgen, K., (2013). The effect of governance on the performance of commercial banks in Kenya: a panel study. Corporate Governance: The international journal of business in society, 13(3), pp.236-248. Owolabi, S.A. and Inyang, U.E., (2013). International pragmatic review and assessment of capital structure determinants. Kuwait Chapter of the Arabian Journal of Business and Management Review, 2(6), pp.82-90.